Murder is the crime of intentionally killing a person, where the element of intent is required (prior intent is referred to as ‘malice aforethought’, AKA premeditated murder). Manslaughter is the crime of killing a person by another who did not intend to do so, or who cannot be held fully-accountable for their actions due to some impairment. They lack 'malice of forethought', and manslaughter is considered a 'crime of passion'. Homicide is the act of killing another person, and includes both murder and manslaughter; homicide doesn't even necessarily constitute a crime, eg the State can execute convicted murderers to deliver capital punishment, or a person can kill another in self-defense; these are considered types of justifiable homicide. In the Bible, the Hebrew word used for 'homicide' is commonly translated as 'bloodshed', referring broadly to a human (or animal) who kills a human; however, the meaning is doesn't try to specify the intent of the killer. When you try to get any more specific to determine the intent of the killer, the translation of ancient Hebrew words used to differentiate between types of homicide gets fuzzy, where modern concepts we rely on today simply didn't exist as well-defined words in hoary antiquity; what is often translated as 'murder' (which requires prior intent) is quite possibly referring to 'manslaughter' (which doesn't), and vice-versa. The situation is complicated by the shifting meanings of words within languages over time, and translating across multiple languages (ie propagation of errors), etc. As a result, confusion over the proper interpretation of the account of Cain and Abel is not only a problem for modern readers, but it was for ancient readers, as well: determining Cain's intent has been a long-running dispute amongst rabbis, starting long before Christianity emerged (and the shifting sands of various interpretations of the Cain account is well-documented in Judeo-Christian apocryphal and intertestamental writings). The problem is compounded when few modern readers bother to investigate what actually IS known about ancient Hebrew concepts of homicide and historical usage of terminology, so they're likely to apply their modern conceptions upon these ancient writings; this virtually guarantees ending up with an anachronistic (out-of-time) interpretation, thus likely missing the authors' originally-intended message for the account. Clearly then, obtaining a proper rendering is going to require more than simply relying on language translators alone, and we're going to have to examine the context, applying the skills of literary analysis to see if any clues can be found in later chapters of the work to suggest the intended meaning. Those disclaimers noted, let's proceed. 1 Adam made love to his wife Eve, and she became pregnant and gave birth to Cain. She said, “With the help of the Lord I have brought forth a man.” 2 Later she gave birth to his brother Abel. Remember, the story is set some 2,500 years BEFORE God gave explicit step-by-step instructions in the Torah, telling Israelites how to perform sacrificial rituals to atone for sins, how to provide wellness offerings, etc. The 'Law of Moses' (AKA the Torah) specified WHAT animal sacrifice was needed to atone for WHICH sin, and since it was all explicitly spelled out, atoning for sin became almost mechanical, a matter of simply following directions (the sinner had to repent in the proper spirit, of course, asking the person they harmed for forgiveness, but these details are also explained in writing). 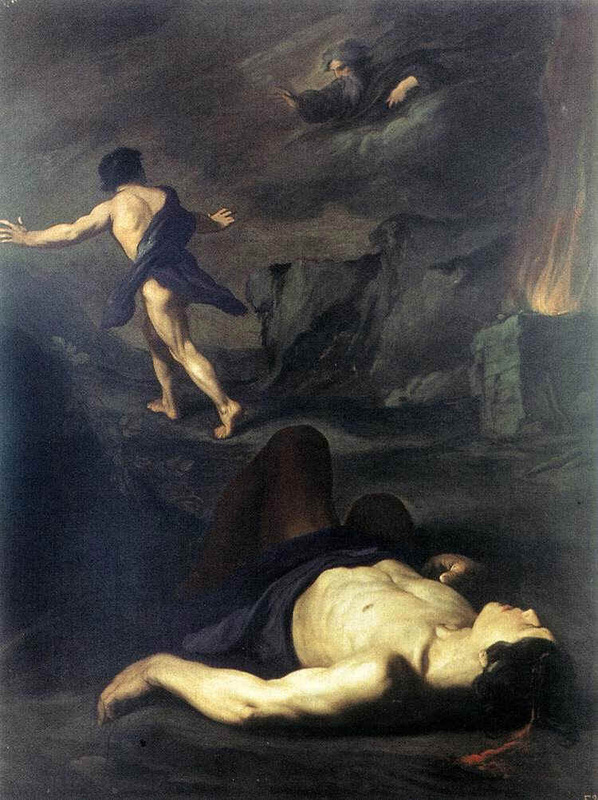 However, Cain and Abel had been given no such instructions from God, so their sacrifices were offered SOLELY on the basis of FAITH: they were in essence 'flying blind', required to gauge God's reaction to their sacrifices to see if God looked favorably upon their offerings, and if they passed God's test. Of course, Abel (and his sacrifice) received God's favor, whereas Cain (and his offering) did not garner such praise. Paul considered Abel's actions so important to understanding faith, he offered Abel as his very-first example of a "hero of faith": although having no instructions to follow, Abel trusted his offering would be pleasing to God (although he didn't know for certain). That's what faith is: confidence that what you're doing is pleasing to God, without having any tangible evidence or feedback upon which to rely (of course, once God voiced His approval of Abel's offering, faith was no longer needed: Abel's demonstration of faith was then validated). Notice that while Abel's sacrifice is described in great detail ("fat portions of some of the firstborn of his flock"), Cain's offering is mentioned in passing ("some of the fruits of the soil"), i.e. there's no mention of being Cain's 'first-fruits' (i.e. the best of his crops). The author is glossing over Cain's offering, just as God did; and while not rejected per se, Cain and his offering are not seen by God (or the author of Genesis) as being particularly noteworthy. Cain didn't exactly fail (ie his offer wasn't rejected), but he also didn't earn God's praise. Cain simply met minimum standards: he passed. The unstated message was crystal-clear to those post-exilic Hebrews listening to the account in 400 BCE: even though you MAY bring less than the 'cream of the crop' to offer to Jehovah, do you REALLY want to risk being somewhat of a disappointment to God, like Cain was? "Do what is right" refers to the Jewish belief that adults have both a 'yetzer hatov' (inclination for good) and a 'yetzer hara' (inclination for evil), where the latter phrase refers to the TENDENCY or INCLINATION for evil which all humans intrinsically possess: each person is expected to learn to CONTROL and rule over their impulses. God is telling Cain to get a handle on his anger management skills lest his temper gets a handle on him. In fact, most modern-day Jews still believe all humans have an evil tendency as a BASIC and NECESSARY component of their human nature, since the 'yetzer hara' is not seen as 'evil' per se, but the same force that drives a person to get out of bed in the morning, go to work, build a house, marry, reproduce, raise a family, etc. The PROBLEM comes when the 'yetzer hara' is not kept in check with the 'yetzer hatov', and the person devolves into a self-centered gluttonous and drunken hedonist who gives in to his basest urges and desires. Note too that the 'yetzer hara' is NOT considered as resulting from Adam's 'original sin'; instead, Jews view it as a God-given trait, instilled at mankind's creation, eg Eve displayed her inability to control her 'yetzer hara' by giving in to her desire for wisdom by eating of the forbidden fruit (and notice the timing: this was BEFORE Adam had eaten the fruit, an act which is blamed for introducing sin and death into the World; hence, Eve's 'yetzer hara' could not logically be resultant from Adamic sin). Instead, Adam and Eve's evil inclination got the better of them both, manifesting as disobedience to the ONE Divine prohibition given to Adam in Genesis. Thus Jews conceive of ALL humans being created by God with a 'yetzer hara', where the 'yetzer hatov' doesn't emerge until early adulthood, when the rational intellect emerges to help counter-balance and control the 'yetzer hara' (and that's exactly the occasion the bar/bat mitzvah ceremony celebrates: the age when the 'yetzer hatov' is expected to emerge). Per normative Jewish beliefs, in addition to the 'yetzer hatov', God also handed down Divine laws in the Torah to 'help' man overcome the inclination towards evil, the best example being the "no bloodshed" law in Genesis 9. So duly-armed with their newfound decision-making capabilities (fueled by wisdom stolen from God by eating the forbidden fruit, which metaphorically 'opened their eyes' to the world of moral decision-making), Adam and Eve were left adrift in the World, forced to rely upon their own sense of right and wrong after being driven from God's presence in the Garden of Eden. They had no choice BUT to use their own new-found sense of morality to make proper and wise choices, having been alienated from God and driven from His presence. God is thus allowing them to exist in a state of anarchy, forcing them to operate on their own, free from God-given morality. Fact is, the Bible contains NO record of any additional laws having been given to humanity by God after they were expelled from the Garden; there is a conspicuous vacuum of God-given laws until AFTER the Flood, and hence ALL subsequent decisions humankind made after being ejected from the Garden were made completely reliant on their use of free will (and made on faith). "sin is crouching at your door". From that phrase, can the reader conclude God was giving Cain a warning not to sin by killing Abel? More importantly: does that phrase suggest Cain would be PUNISHED by God for killing Abel? At that point, was homicide actually considered a punishable sin by God? As explained in the prior article on Noah and the Flood, God's solution to the problem of 'yetzer hara' (man's evil inclination) is found in Genesis 9:5-6, where Jehovah prohibits bloodshed, promising humanity He would hold killers accountable for any human blood they spilled; this was described by God as a blessing, since humans could rest assured that if anyone spilled THEIR blood, God would demand an accounting from their killer. You do believe justice is nice, right, knowing your killer would be punished if you were killed? Of course: justice appeals to (most) everyone's fundamental sense of fairness, atheist and theist alike. But nevertheless, the act of bloodshed had YET to be pronounced by God to be a sin, since the account of Cain and Abel is set some 1,500 years BEFORE the Noahide Covenant prohibited bloodshed for all descendants of Noah (i.e. all humanity) was pronounced, with God delegating His Divine authority to allow "just" Noah to establish the first judicial system to enforce the newly-given law, placing other humans under his dominion by ruling on murder cases and rendering capital punishment to execute convicted murderers. So how could God be warning Cain about violating God's Law against bloodshed in Genesis 4, LONG BEFORE God had gotten around to officially declaring bloodshed to BE a sin (as found in Chapter 9)? Last I checked, Genesis Chapter 4 comes well BEFORE Chapter 9. 12 Therefore, just as sin entered the world through one man, and death through sin, and in this way death came to all people, because all sinned— 13 To be sure, sin was in the world before the law was given, but sin is not charged against anyone’s account where there is no law. In verse 12, Paul is clearly referring to Adam's 'original' sin as being the cause of death for all humans, where punishment for Adam's disobedience is supposedly inherited by ALL of Adam's offspring (incidentally, note the ancient Hebrew concept of 'familial obligation by inheritance of debts of one's forefathers' on full display: most modern societies don't follow that principle any longer, but excuse debts upon the death of the person who incurred the debt (or at least, take it from their estate). We'll see the same concept reflected again in the "curse of Ham", with his son Canaan forced to bear the consequences for the sins of the father. But focus on the almost-parenthetical comment that follows in Verse 13, where Paul explains although 'Non-Adamic' sins WERE committed before the Law (of Moses) had been handed down on Mt Sinai, God had to actually define WHICH specific actions were prohibited by actually declaring them to be 'chargeable offenses' BEFORE humans could be held accountable for these actions! So without a law specifically prohibiting a certain action, there is no chargeable sin, per Paul. With Verse 13 and in so many words, Paul is implying God follows the legal doctrine of 'Nulla poena sine lege' (Latin: no penalty without a law), a legal principle that says one cannot be punished for carrying out an action which hadn't been prohibited by law at the time the act was committed; this legal principle is accepted and codified in modern democratic Nations around the Globe as a basic requirement for rule of law. But even more specifically, an examination of Divine prohibitions found throughout the Bible suggests that while an action may be considered contrary to the fundamental NATURE of God, the Divine expression MUST also specify the penalty BEFORE it is considered a chargeable violation of Divine Law (i.e. a sin). 16 And the Lord God commanded the man, “You are free to eat from any tree in the garden; 17 but you must not eat from the tree of the knowledge of good and evil, for when you eat from it you will certainly die." Note the form: a negative commandment, followed by the punishment. “Whoever sheds human blood, by humans shall their blood be shed"
2) the punishment, AKA the consequences for violating the command. So to put an even finer point on it, Divine expressions found in the Torah seemingly rely on the ancient legal doctrine of 'nulla poena sine lege certa', ie. there is no violation without definite law. This principle states that a penal statute must specify BOTH the punishable offense AND the penalty with sufficient definiteness to allow humans to know which specific actions are punishable, in order to conduct themselves accordingly (or face the clearly-stated consequences). Even today, this principle is still with us and expresses the general principle of the requirement of legal certainty in matters of criminal law, being recognized and/or codified in many jurisdictions. The Divine Prohibition against eating the fruit meets this higher legal standard of certainty, as does the Noahide prohibition against bloodshed (both clearly stated the penalties as death). 13 To be sure, sin was in the world before the law (i.e. the 'Law of Moses') was given, but sin is not charged against anyone’s account where there is no law. Paul was saying that while the action that later constitutes a sin may have been committed by humans, it was not considered by God as a chargeable sin until AFTER God had gotten around to officially declaring the act to BE a chargeable sin, since God does not pass a law and retroactively hold past violators accountable for their prior actions. That wouldn't be fair, AKA moving the goalposts. So in Paul's eyes, humans who lived before the Flood were given a "free pass" by God for their sins, since a Divine prohibition against bloodshed had yet to be declared. Paul is thus excusing the perceived leniency of God's "perfect justice" for not just the "first human to commit murder", Cain, but also Lamech (who killed a young man for striking him). It bears remembering that the later Mosaic Covenant had to be RATIFIED by a ritual (found in Exodus 24) wherein the Israelites, the 'Children of God', agreed to become counter-parties to God's covenant AFTER the entire Law of Moses had been read aloud to them; after hearing the Law, they entered into a Covenant arrangement which bound them to abide by the laws they just heard. However, those humans who lived before the Flood obviously weren't subject to Mosaic Law (which hadn't yet been written, and wouldn't matter, since they were long-since dead, having been killed in the Flood thousands of years before)! Jews alone are bound by the dictates of Mosaic law, since they are parties to the Mosaic Covenant, signified as bound by the 'covenant marker', eg the visible sign of circumcision (for one). Of course, the Jewish people were still a distant twinkle in Noah's eyes, coming millennia later (and even moreso, in Cain's eyes). So while 'sin' may 'have been crouching at (Cain's) door', it's likely God was referring to humanity as a whole, warning about what subsequently happened after the Flood: bloodshed was condemned by God as a sin, and its punishment was described. Hence a new chargeable sin had entered the World, since the sin of murder was no longer crouching at the door, but was inside the house, with Godly wrath following for all humans who commit bloodshed. In literature, such elements are called 'dramatic foreshadowing', and the Yahwist was nothing, if not a subtle master of the pun, and skilled in his use of such literary devices as foreshadowing. The account of Cain and Abel serves as justification as to WHY the Flood was needed: men were following their yetzer hara (evil inclinations of the heart), so God needed to up the ante, declaring murder as a sin and bolstering it with some Divine laws, culminating in the Torah. (And what of the inevitable small infants and innocents who died as flood victims, you may be wondering? The Flood account completely ignores their right to individual justice, since God wiped the face of the Earth clean of ALL humanity, rather than having Noah mete out justice individually. In summary, it was as if before the Flood, God was 'beta-testing' the concept of letting mankind operate by free will and faith, rather than giving mankind a bunch of cumbersome rules they must follow at the risk of Divine punishment. That WAS the ideal of man's existence before the Fall: minimal rules, operating on faith alone. After the Fall, God titrated rules to mankind, leading up to the Law of Moses being handed down upon Mt Sinai, as described in Exodus. The 'law brings wrath' refers to the wrath OF GOD, meaning the law demands the sinner be punished in God's name, in accord with the dictates of the given law. But again, according to Paul, before there is law, there is no transgression; hence no Divine wrath. So this was how the early Christian apologetist Paul addressed the thorny issue of God's perceived lenience in handling the punishment of Cain delivered by God's hands: per Paul, there was no law against bloodshed, and thus no transgression; hence no need to punish murderers like Cain. In Paul's eyes, the lax punishment of Cain WAS tantamount to letting him literally get away with murder (as the name of the article suggests), so Paul seemingly rationalized away any resultant cognitive dissonance by concluding Cain's treatment at God's hand stemmed from the lack of laws against bloodshed at the time. It's interesting to note the earlier Qamran text does not contain the phrase, 'Let's go out to the field': it appears to be a late addition found in the source text used to create modern versions of the Christian Old Testament (including the Masoretic Text). The possible reason for the addition? It was likely added to bolster the idea there were no eyewitnesses to the killing, since it was said to have occurred in a field (the typical interpretation of this distinctive Hebrew idiom is to suggest no eyewitnesses were available to testify against the killer). Of course, later Mosaic Law included the infamous "two witness" rule which held no one could be punished for a capital crime if there's not at least two witnesses available to testify against them. So not only did Cain lie to God, Cain was a bit of a smart-alek, sarcastically cracking wise: "Am I my brother's keeper?" is a reference to Abel's (a shepherd) need to keep track of his livestock, whereas Cain was a farmer: he had to shepherd and keep herd over his.... crops? "Free-range vegetables"? So God is allowing the "testimony" of one witness: Abel's blood, crying out from the ground and demanding justice. Although some scholars have suggested the possibility God is merely informing Cain of the consequence of "blood pollution" causing the ground to become unproductive, it's unlikely; instead, God is personally delivering the curse as a form of punishment since God later pledges in Genesis 8 to "never again curse the ground due to man's evil inclination". Remember, God had "boots on the ground" after the Flood to handle punishment for expressions of man's evil inclination, so there was no more need for God to personally curse the ground to punish men for following their 'yetzer hara' (like He did for both Adam and Cain). The Hebrew word (‘ă·wō·nî) uttered by Cain is translated as 'my punishment' in the NIV (above), but elsewhere in the Torah (and in other modern translations) the word is more-often rendered as 'my iniquity', referring to the inclination TO sin, NOT referring to the punishment FOR sin. 'Sin' and 'iniquity' are NOT synonyms, a subtle distinction often lost on many modern readers who tend to view them as interchangeable. Some translators obviously preferred 'punishment', since they likely approached the account pre-loaded with millennia of biases, relying on the traditional interpretation that hold Cain as guilty of the World's first murder of his brother (fratricide). Problem is, this assumption also forces translators to depict God as grossly erring on the side of excessive mercy for the murderer, deprecating God's "perfect" sense of justice by allowing Cain to literally get away with murder (God even gave Cain His PROTECTION, thus PREVENTING retribution and avenging for Abel's death)! Any way you look at it, that's a perverse definition of 'punishment', and likely why Paul dismissed that possibility by saying there was no law in effect at the time, hence no punishment: this was Paul's excuse for God's lenient punishment. But viewed in light of Cain's pleading manslaughter, it's likely Cain is confessing that the perversion of his heart was simply too great for him to overcome, a tacit admission he couldn't control his 'yetzer hara' (as God had warned him to do); this confession self-condemned Cain as being Ungodly (or not Holy, not set apart for God), hence unfit to remain in God's presence, just as Cain's father had similarly been driven out of the Garden of Eden for failing to control his 'evil inclination' by disobeying God's prohibition. 13 Cain said to the Lord, "My perversion is more than I can bear". Cain is tormented by guilt over being unable to overcome his evil inclination, which led to the death of his brother, with Cain acknowledging his powerlessness to control it. In modern legal parlance, Cain essentially is pleading 'not guilty of murder, by reason of temporary insanity', and thus is pleading guilty to a 'crime of passion', having been driven by an irresistible impulse. And though not explicitly stated, God's sentencing indicates He seemingly accepted Cain's manslaughter plea, delivering the punishment consistent with that later prescribed NOT for MURDER ("life for a life"), but for MANSLAUGHTER. As the old saying goes, the punishment must fit the crime; in this case, God's punishment is pointing towards manslaughter, not murder. Of course, being "hidden from the presence of God" is the same fate experienced by Lot when his story concluded, last seen living in a cave and engaging in drunken incestuous relations with his daughters. Cain is no better off in the eyes of God than supposedly "righteous" Lot, since Cain also is hidden "from the Lord's presence". So contrary to Paul's assessment of "no law means no punishment", it's clear from the account that Cain IS being driven from the ancestral homeland of his birth and from God's presence, where the judgment delivered by God (i.e. cursing the ground, as was done for Adam) constitutes God's punishment. Paul thus missed the POINT of the account of Cain, and was likely led astray by assuming the account depicted murder, just as most readers had done for centuries before him. No doubt in Paul's eyes, the punishment was so lax and deviated so far from the Mosaic Code's punishment which called for "blood for blood" (Lex Talionis), Paul misread the account as providing NO punishment, coming up instead with his "there were no laws" defense. So then, what other evidence from the account suggests God's tacit verdict was actually manslaughter, and not murder? 15 But the Lord said to him, “Not so; anyone who kills Cain will suffer vengeance seven times over.” Then the Lord put a mark on Cain so that no one who found him would kill him. After Cain essentially pleads "not guilty of murder, by reason of temporary insanity", God provides him with the protective 'mark of Cain', preventing any retaliation for Abel's death from would-be 'blood avengers' (a role later fulfilled by the familial 'go-el haddam'). The reference to the 'mark of Cain' serves as dramatic foreshadowing for the Torah's later establishment and designation of 'cities of refuge', towns which were part-and-parcel of Ancient Israel's judicial system, having been designated to provide sanctuary to those who were determined to have committed MANSLAUGHTER (they were NOT to serve as permanent refuge for murderers). Make no mistake: 'cities of refuge' didn't exist as some aberration that existed outside of Mosaic Law; instead, the institution of such locations of asylum from blood avengers WAS the legal mechanism that existed in Biblical Israel to deal with homicide! This WAS the God-given system of justice, as found in the Bible! (Details are given in Numbers 35:9-34 and Deuteronomy 19:1-13, with God giving explicit instructions for where 'cities of refuge' were to be located, how such cases are to be handled, etc). How then did this God-given system of justice operate? If ANY killing (whether murder or manslaughter) occurred, the killer was supposed to immediately flee to the nearest 'city of refuge' to escape their 'blood avenger', a relative of the victim who was permitted to chase after the killer in hot pursuit and murder them with impunity, even if the killing of their relative took place only moments earlier. The idea was that if the person who killed another was caught and killed by the blood avenger, then God's hand played a role in allowing them to catch the killer: the would-be refugee was considered to have been guilty of murder, since God presumably allowed it to happen. God's justice was served. But if the killer managed to escape from their would-be avenger while fleeing to the nearest city of refuge, once he arrived inside city walls he had to request a trial by the city elders in order to determine if he was innocent of murder, explaining what happened; if city elders ruled it as manslaughter, the killer would be permitted to stay as a permanent resident in the city, being granted asylum. But if after hearing the case, the city elders ruled the killer was guilty of murder, they were required to immediately hand him over to the familial blood avenger so he could carry out the execution on the spot, thus fulfilling his duty to God to see that justice was served by avenging his relative's spilled blood. So God giving the protective mark of Cain implies He tacitly judged Cain to be guilty of manslaughter, and NOT murder; God was analogously granting Cain His permanent protection, later afforded by the killer being granted permanent residence within a 'city of refuge' after trial by city elders. 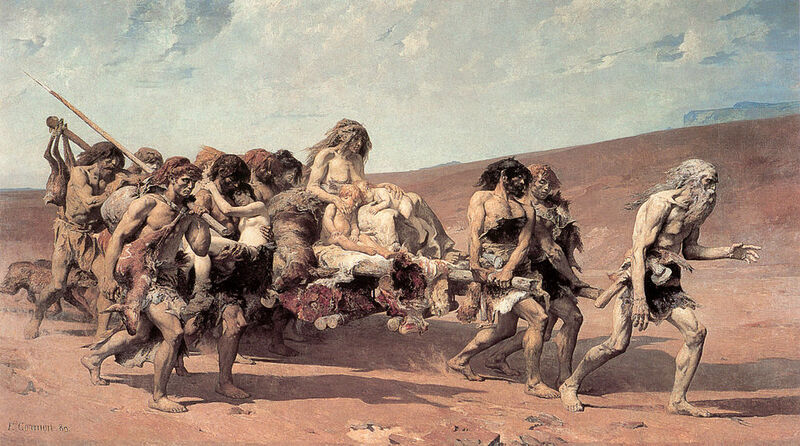 But since the Cain story occurred long before God had instituted the 'cities of refuge' in later Mosaic Law, Cain was instead forced to 'wander the Earth': it was as if Cain's 'city of refuge' WAS the entire face of the Earth, protected by the God-given 'mark of Cain'. The 'mark of Cain' is thus homologous to a killer in ancient Hebrew society who was found guilty of manslaughter and granted permanent residency within the 'city of refuge' and provided safe harbor from a blood avenger, BUT ONLY AS LONG as he remained inside the city walls: the avenger was allowed to kill him without incurring bloodguilt if he should find the refugee outside of the city's walls, since he loses immunity by stepping outside of the protective boundary (i.e. immunity is conditioned on staying inside). That's simply how criminal justice operated in ancient Hebrew society, likely instituted under the Kingdom of Solomon and continuing until the Babylonian conquest some 400 yrs later (when Jews were prohibited from exercising their own system of justice, but instead were expected to use the legal system of their conquerors). 16 So Cain went out from the Lord’s presence and lived in the land of Nod, east of Eden. 'Nod' is a Hebrew word meaning 'wandering', and hence Cain is taking up a life of eternal wandering, since the ground is cursed by God as infertile for Cain's efforts to grow crops; hence Cain needs to survive, presumably by being a hunter of wild animals (although note that humans weren't officially given permission to consume meat for food by God until after the Flood in Genesis 9, but again, that's a legalistic 'gray area', since it too wasn't explicitly PROHIBITED by God before the Flood, either). Cain being guilty of manslaughter thus explains God's lenient punishment, since it's NOT lenient punishment for manslaughter. Otherwise, God is depicted as tilting the scales of justice in favor of the murderer, where the punishment for murder after the Flood (some 1,500 years later) found in Genesis 9 demanded "life for life, blood for blood" (AKA Lex Talionis). 17 "'Anyone who takes the life of a human being is to be put to death." 12“Anyone who strikes a person with a fatal blow is to be put to death." It should be clear that murder demanded a life for a life, and God clearly didn't demand Cain's life as punishment for Abel's spilled blood. 13 However, if it is not done intentionally, but God lets it happen, they are to flee to a place I will designate." 14 But if anyone schemes and kills someone deliberately, that person is to be taken from my altar and put to death. Although biblical law requires that death be the result of direct physical assault in order for the slayer to be subject to legal action, that requirement is not sufficient. Intent to kill is necessary as well. Exod 21:14 defines intentional homicide as premeditated. Its cause is the direct physical act of the killer who treacherously lies in wait. What about that odd expression, "but God lets it happen" phrase, found in Verse 13? On the other hand, the cause of the other grade of homicide signaled in Exodus 21:13 is ascribed as God (10). By attributing to God the responsibility for accidental homicide, the Covenant Code holds the view that visible agents of the killing – implements of wood, stone, or metal – are equally directed by the ultimate mover (God). (11). Accidental killing is equated with an accident without a human cause. Even in cases of accidental death, God's hand was still seen at work as the cause: there's an ancient rabbinical saying that even in cases of accidental killing, God wouldn't allow a truly righteous person to kill another, even if by accident. There are no such things as accidents, in the ancient Hebrew Worldview. Thus the accidental killer ALWAYS had a cloud of suspicious hanging over his head, as if God was punishing him for some unknown sin; the accidental killer was barred from serving any role of leadership within the Hebrew community, since in the eyes of ancient Jews, no accident is truly an accident but always the result of God working in ways beyond human comprehension. And just like Cain didn't get off scot-free (God cursed the ground for him), Jews also attached an invisible stigma upon the accidental killer (note that the Greek word 'stigma' literally means a 'mark', just like the "mark of Cain" was given to him by God). Regardless of later practices, though, the account depicts God judging Cain as guilty of accidental homicide, AKA manslaughter, since the punishment fits the offense. "Surely I will require your lifeblood; from every beast I will require it. And from every man, from every man's brother I will require the life of man."). Similarly, the account of Cain ALSO foreshadows the emergence of practices described later in the Torah, requiring a relative to serve in the role of the 'go'el', the avenger of a relative's life lost due to homicide. This obligation often fell on the eldest male of the victim's family; hence, Genesis 9 mentions "from every man's brother", referring to the familial avenger who was duty-bound and obligated to dispense justice as God's executioner. It bears repeating that intentional murderers were NOT granted safe harbor in a 'city of refuge'; the option to stay was ONLY granted after the killing was ruled by city elders to be due to an accident, or even a crime of passion (i.e. it was ruled to be accidental manslaughter, lacking premeditated malice). And if the go'el caught the killer as they were fleeing to a 'city of refuge', it was considered as if God allowed the avenger to catch the killer: the would-be refugee was obviously guilty, and killed by the avenger (even if it truly WAS accidental). One of the bonuses provided by the practice of blood vengeance was it had the effect of preventing escalation of violence within Hebrew society, since the role of the avenger was limited to only ONE member of the victim's family; this person alone enjoyed immunity from incurring bloodguilt if he were to murder the fleeing killer. The intent of the restriction was to limit violence and prevent escalation into an unlimited 'Hatfield vs McCoy' familial feud, with war breaking out between battling clans, devolving into unregulated vigilantism (which Cain feared, complaining to God about how he'd be killed in retaliation, where God responded by giving him the protective "mark of Cain"). However, even when the account is viewed as depicting manslaughter, God seemingly overshot the mark, since Cain was given complete immunity from avengers. Remember that God is serving in the role later filled by the elders in the 'city of refuge', as His unstated verdict judges Cain to be guilty of manslaughter only, and thus Cain is granted permanent protection by giving him the "mark of Cain". The story is thus like many of the other accounts in Genesis, serving the literary function of demonstrating the benefits of provisions later appearing in the Torah, with improved methods of offering a place of refuge for those who commit manslaughter (vs Cain being forced to wander the Earth and being unable to put down roots), while allowing the family of the victim to seek retribution. Even the question Cain asked God about whether he was his brother's keeper is foreshadowing the familial blood avenger practice, wherein by expecting the eldest male to serve in the role, God was answering that YES, eldest brothers were expected to protect their younger siblings, even avenging their deaths. However, perhaps this kind of early 'blood feud' vengeance is the kind of 'justice' which led Jesus to denounce 'lex talonis' retributive justice as not such a great idea, after all, eg the person who killed a complete stranger without having any prior ill-intent had to leave their family behind and flee to the nearest city of refuge, or else risk being murdered by a member of the grief-stricken family. Some "justice", huh, especially if the killing actually WAS accidental? Note the son of Cain was named Enoch (Hebrew meaning, 'initiate'). The name also appears in the descendants of Seth, likely reflecting how individuals are becoming increasingly dedicated to their respective lifestyles, since Enoch is described as the first human to initiate religious worship of Jehovah. Hence Cain's son is an initiate to seeking fame, as the city was named after him. 19 Lamech married two women, one named Adah and the other Zillah. 20 Adah gave birth to Jabal; he was the father of those who live in tents and raise livestock. 21 His brother’s name was Jubal; he was the father of all who play stringed instruments and pipes. 22 Zillah also had a son, Tubal-Cain, who forged all kinds of tools out of bronze and iron. Tubal-Cain’s sister was Naamah. Notice how the descendants of Cain had to raise livestock; they developed cities (the pastoral lifestyle of dead Abel was considered the virtuous and Godly path), built musical instruments, and developed 'evil' metal tools (used to build cities, make weapons, and needed to work the cursed ground to defy God's curse). Clearly the descendants of Cain are headed for trouble. All of these were intended to portray efforts towards building human-centered civilizations and creating "a name for themselves", becoming increasingly defiant to God by glorifying the accomplishments of men (and if your parents didn't let you learn to play a musical instrument when you were young, or join marching band in Junior High, this is likely the reason: they didn't want you becoming like Jubal, one of the descendants of Cain!). Lamech even bragged to his wives about the perverse incentive that God's protection of Cain had created, based on his misunderstanding of God's "mark of Cain" which seemingly left killers completely immune from retaliation for murder (since God had yet to announce an official policy prohibiting bloodshed). Lamech's song reveals his mistaken understanding: he sees God as having given Cain a protective mark giving total immunity for murder, which clearly had a perverse effect on humanity, as the violence and bloodshed only worsened in the aftermath of Abel's death. This trend increased, eventually leading God to regret making mankind, deciding to give the Earth a good scrubbing so He could start all over again (except remembering to give mankind a new law against bloodshed, right after hitting the reset button). Nevertheless, the story of Cain and Abel was likely written to demonstrate God's grace and mercy for those guilty of manslaughter, but it also depicts humans having taken advantage of God's merciful nature, misreading God's lenience towards manslaughter by improperly thinking such a policy applies to murder, as well! Note how Lamech brags about retaliating completely out of proportion to the original insult, killing a young man for wounding him: this is NOT 'like for like' retaliation, as later offered by Lex Talionis! The author was likely making a case for the improvements found later in the Torah, but in trying to portray Lamech's confusion over God's punishment for manslaughter, the Yahwist ended up confusing untold generations of rabbis, priests, and readers, as well, who were confused by the depiction of Lamech's confusion! Either way you cut it, the story indicates God failed to declare bloodshed a sin after the fall of Adam, and hence couldn't hold humans accountable for their actions (per Paul). The standard Christian interpretation of Cain as "the World's first murderer, guilty of fratricide" leaves an even-uglier prospect, a rendition of a God who is "soft on crime", since later Mosaic law called for the killer's death! That interpretation raises more-problematic questions about God's claimed traits of immutability, when simply interpreting the account properly avoids opening such cans of worms. Regardless, God is depicted as contributing to the widespread and increasing lawlessness of the pre-Flood World, until "just" Noah was given the job of building an ark to save himself and his family, where God blessed Noah and family by giving them a Divine "No Bloodshed" law in Genesis 9:5-6; God promises to start holding humans individually accountable for any blood they spill thereafter. Anarchy is eliminated, marking the beginning of the institution of human governance operating by the rule of law. As an aside: at his birth, Noah was prophesied by his father (also named Lamech) to remove God's curse of the ground for the benefit of all mankind, thus giving him the name, 'Noah' (Hebrew for 'rest' or 'comfort'). 28 Lamech lived one hundred and eighty-two years, and became the father of a son. 29 Now he called his name Noah, saying, "This one will give us rest from our work and from the toil of our hands arising from the ground which the LORD has cursed." Noah certainly lived up to the prophecy: God lifted the curse of the ground after finding an alternative way to punish humans for acting upon their evil inclinations. Noah secured God's promise to never again curse the ground on account of the wickedness of men, with God instead blessing Noah and family with the comfort of living under a newly-instituted system of criminal justice, facilitated by the Divine prohibition against bloodshed. Noah was appointed by God to serve as the first administrator of criminal and civil justice on Earth, being "just" and "righteous amongst his generation". In essence, this meant God had another means to provide justice to mankind, so He promised to never again curse the arable land on account of the actions of men. Noah, a farmer, was the first person to plant a vineyard. Note the story of Noah builds to a crescendo, concluding with the "curse of Ham", the ULTIMATE means by which Noah lives up to his father's prophecy of "giving humans rest from their work and from the toil of our hands". Noah's only recorded words after being delegated God-given authority to establish rule of law is to introduce the institution of slavery to humanity! Noah is recorded as praising God within the same breath that he condemns Canaan's descendants to be slaves (Canaan's descendants are commonly interpreted to be the black people of Africa, serving as convenient justification). Of course, the introduction to the young Canaan character also constitutes literary foreshadowing, laying the groundwork for the later reappearance of the Canaanites in the story after the Israelites (considered to be descendants of Seth) depart Egypt. You likely already know that in the Torah, the Canaanites serve as the arch-enemies of the Israelites who were not only kept as slaves, but who's territory ("the promised land, "the land flowing with milk and honey") was invaded and taken away after they were slaughtered in genocidal campaigns conducted by God's "chosen people" (the accounts are detailed in the Book of Joshua). Noah thus provided "rest" to some of his descendants by placing others under the their dominion, such that three millennia later, Southern slave owners could sip on mint juleps on their plantation as their black slaves were sweating in the cotton fields. Christian slave owners (and their pastors) could even point to the Bible to justify their ownership of other humans, placing them under their dominion (where Jesus often used the theme of slavery in many of his parables, without so much as denouncing it). 20 He carried into exile to Babylon the remnant, who escaped from the sword, and they became servants to him and his successors until the kingdom of Persia came to power. Remember that Noah is considered a holy man who "walked with God", and Noah's 'delivering a curse' implies he is asking God to act against the cursed individuals, just as when Noah similarly asks God to act on Shem's behalf when pronouncing his blessing. So clearly God is able to choose whether to act on the requested curse and/or blessing, or Noah's utterances wouldn't have had any effect! God doesn't HAVE to fulfill his faithful servants request. However, as the Bible later clearly shows, God approved both requests, and the same verses that condemn the descendants of Canaan to slavery also bless the descendants of Shem, a lineage that produced the Israelites and led to Jesus. God approved both requests, using Noah's newly-created concept of slavery to fulfill His purposes. God approves of slavery. The early Christians certainly must've engaged in many debates of the troublesome question of why Genesis suggested Cain got away with murder; Paul decided it was simply due to an absence of any Divine prohibition against bloodshed before the Flood, even seemingly trying to apply common principles from Greek and Roman law of his day to explain away the discrepancy. However, it's likely Paul (and so many others) missed the subtle literary references which point to the account serving as foreshadowing for the Torah's unveiling of the 'blood avenger' practice for murder and manslaughter, with its establishment of 'cities of refuge' to escape blood vengeance. As a Hellenized Jew and a Roman citizen born in Tarsus (a city in modern-day Turkey, quite a distance from Jerusalem), as well someone who lived long after the Torah was in active use as legal code in Judea and Israel, Paul likely went awry by applying principles of Greek and Roman law to Ancient Hebrew codes which had long-since fallen into disuse, last-exercised some 500 years before his birth. Paul thus fell victim to anachronistic thinking, misapplying and projecting legal concepts from his day onto the ancient past, with millennia of propagation of such errors continuing to this day amongst Christians who continue to improperly think of Cain as "the World's first murderer", in essence overriding the implied verdict handed down to God in the account. "Do not be like Cain, who belonged to the evil one and murdered his brother. And why did he murder him? Because his own actions were evil and his brother's were righteous." The Greek word translated as 'murder' in the NIV is 'esphaxen' which is more-properly handed as 'slaughter' (slew); the Greek word doesn't carry any element of intent, as 'murder' requires. To render it as 'murder' is thus a questionable translation, and we see that the author of 1st John was willing to insert details and incriminating evidence into the ancient Hebrew account in order to bolster the murder case against Cain (and what was the "action" of Cain that was considered "evil"? You cannot say it was Cain murdering Abel, since the question is, WHY did Cain murder Abel? Circular logic much)? Hence it's important to check WHICH translation your Bible is using for a given passage, as they don't always get it right. I highly recommend using a site (such as the one above) which offers multiple translations and comparing, since the discrepancies are often significant.